The City of Fernandina Beach, Florida, has completed modifications and upgrades to the lights at its Main Beach Park using LED turtle-friendly high power lighting that will protect sea turtle nesting without compromising the public’s safety at night. The LEDtronics SLL003P-800-0UO-004 shoebox-style LED luminaires will offer over 65% energy savings and cost benefits related to reduced maintenance and much extended lifespan compared to traditional incandescent lights. Additionally, the upgrades will provide significant reduction in greenhouse gases. The project was completed in partnership with Amelia Island Sea Turtle Watch and with a grant from Florida’s Sea Turtle Conservancy. The LEDtronics lights meet the requirements of Florida’s F&WCC Wildlife Lighting Certification Program when the luminaire’s light is downward directed in a manner that has minimal intrusion into sea turtle nesting beaches, migratory corridors, and Dark Skies Initiative-friendly communities. 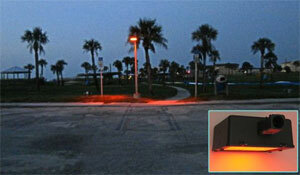 Designed also to avoid disrupting turtle hatchling’s crawl to the sea, the LEDtronics lighting at the Dolphin Avenue and Main Beach parking lots also offered the city the option of reducing the height of the light poles. Additional benefits include: Maintenance-free operation of over 5 years; reduced light pollution — no wasted light; no ultraviolet emission — does not attract insects; enhanced vision — little or no debilitating glare as compared with standard high glare from HID lamps. The GTE Companies of Jacksonville provided project-planning assistance. Vanguard Electric of Jacksonville installed the fixtures. The city’s maintenance crew also played a key role in facilitating this project. The Sea Turtle Grants Program provided funding with proceeds from the sale of Florida’s “Helping Sea Turtles Survive” specialty license plate (www.helpingseaturtles.org). Fernandina Beach on Amelia Island is the northernmost city on the eastern coast of Florida, with a population of around 12,000. The city hosts loggerhead, green and leatherback sea turtles in the nesting season. Many coastal counties and communities in Florida have developed lighting ordinances to reduce hatchling disorientations, since the state boasts the largest nesting concentrations of loggerhead and leatherback sea turtles in the United States. About 80 percent of loggerhead nesting in the southeastern U.S. occurs in six Florida counties. Total estimated nesting in the U.S. has fluctuated between 47,000 and 90,000 nests each year over the past two decades. Based in Torrance, California, LEDtronics, Inc., since 1983 has been a world leader in designing, manufacturing and packaging Solid State Lighting products and state-of-the-art LED’s to meet the world’s constantly changing lighting needs—from industrial control panel LED indicator lights to solid-state LED street light fixtures, LED Post Top or Pendant bulbs, High-Bay or Low Bay fixtures, LED Wall Pack Floodlights from direct incandescent- replacement based LED bulbs to direct fluorescent-replacement T8 and CFL LED tube lamps. A Special thanks to Mr. Len Kreger for the application photos.